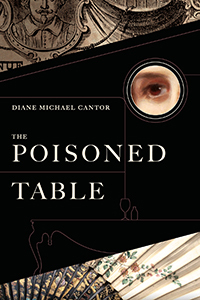 THE POISONED TABLE portrays a passionate rivalry between fictional actress Isabel Graves and real-life Shakespearian stage sensation Frances Anne “Fanny” Kemble. In this tale of ambition, romance, and betrayal, Graves harbors early resentment, convinced that Kemble’s family theatre connections assured Fanny’s selection for the lead role in Romeo and Juliet despite Isabel’s superior beauty and talent. The novel traces their unconnected adventures and acting careers in the Old and New Worlds, as well as their introduction to the horrors of American slavery and to romance with one of the wealthiest men in America, Pierce Butler, owner of Georgia cotton and rice plantations and master of more than 800 slaves. Kemble, an ardent abolitionist, falls in love with Butler and marries him before she discovers his wealth derives soley from slave labor. Though glad to be separated from plantation life at her husband’s Philadelphia home, Kemble agrees to accompany him on his annual visit to inspect his Georgia investments. Butler assures his wife her apprehensions about slavery will be assuaged once she sees firsthand its humane daily operation. Instead, she is sickened and chronicles her visit in Journal of a Residence on a Georgian Plantation in 1838–1839. This account, published in England in 1863, is sometimes credited with dissuading Britain from aiding the Confederacy. Within the novel is a play written by Graves’ lover. Set on a slave plantation, the plot portrays a dinner at the master’s table and the poisonous conditions which produce its bounty, resulting in an attempted murder. In the controversy following this play’s opening night, Kemble and Graves are again at odds, and their rivalry continues as they change places on the stage of theatre and of life.